Upgraded mobile UI to support full set of actions: pinch, horizontal pan, vertical pan, tap, double tap. After showing an image, a higher resulution image will be loaded in background and then displayed when ready. This results in much better quality on high-resolution screens. Rearranged controls so they are more intuitive. Close button is now in top right corner – a more common space. Loading indicator will be shown only if loading takes longer than 800ms. Content positioning is much smarter. Closest corner is used when calculating position, this results in more accurate positioning on different screens. Better performance, smooth experience on mobile and improved visual details. Page with Background template replaced by Full Page Slider Page with Background template was removed because same visual style can be achieved by creating Full Page Slider using single slide. Plus you get various customisation options available in Full Page Slider. After installing 1.5 you must visit admin area. A background script will kick in and migrate your data to a new format. Then you please check all your pages that use Full Page Slider and Page with Background templates. I have tested the migration script many times, however there is a chance that you will need to adjust settings to achieve the desired look. 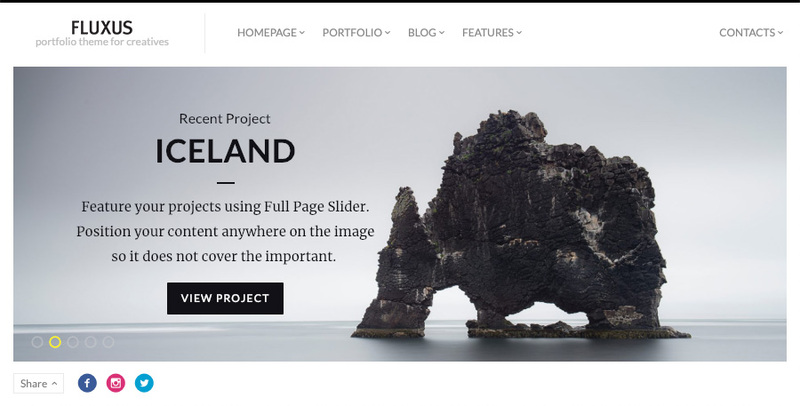 Hope you will enjoy the new Full Page Slider. Fixed: Various translation and content sanitization issues. Updated translation strings in .pot file. Fixed: Removes hard-coded <title> tag as per Wordpress recommendation. Upgrade note. The update introduces few changes to image sizes. This requires you to regenerate your images. Update your theme and use ‘Regenerate Thumbnails’ plugin to automatically resize your images to newly introduced sizes. Improved: Slight improvements to Horizontal Portfolio UI when viewed on mobile. Fixed: Issue that prevented scrolling of project page on mobile after closing Lightbox. Fixed: user.css would not be included when customize.css file is missing. Fixed: Older versions of PHP would throw error due to unsupported syntax. Fixed: Button in Full Page Slider slide with embedded video would show up at all times. Fixed: fluxus-customize.css would result in 404 if accent color was never changed. Changed: Page with Background replaced with Full Page Slider since visually they are no longer different. Improved: Minor design details on various pages: buttons, lightbox, contacts page, footer. Improved: Removed jquery.transit library for performance. All transitions are now CSS based. Fixed: Customizer issue when using HTTPS sometimes it would not work. Improved: Fluxus Lightbox icons were updated. Close icon moved to more natural position. Lightbox will allow "click anywhere" navigation when viewing video. Improved: Icon font packer changed from Fontello to Icomoon, which is superior. Improved: Links in Text Widget now look the same as in other widgets. Improved: Updated Instagram social icon color to match new brand color. Improved: Adds href attribute support to [service href='your-url'] shortcode. Service shortcode outputs alt="" attribute for better SEO and accessibility. Improved: Removes map custom drop icon, instead standard icon by Google Maps will be used. Improved: Gallery shortcode now links to resized images instead of originals. This will prevent cases when 5MB images are slowly loaded where 1MB would be more than enough. Fixed: Compatability issues related to Wordpress 4.9.1. Full Page Slider, Customizer and Theme Options works withuot any errors. Fixed: Custom size images inserted in content will now respect width attribute. Fixed: Accordion styling issue when used in contacts page on dark skin. This will enable Jetpack's Gallery and Carousel. Fluxus will still provide styling rules to make sure Jetpack's gallery looks good. Fixed: Horizontal scrolling user experience on Windows computers. Sticky scrolling had to be removed because of poor performance on Windows. Fluxus now binds mouse wheel to perform horizontal scrolling without sticking to projects / photos. This ensures quality UX on all platforms. Fixed: When PHP notices were on, Appearance > Customize page would display a notice message. Fixed: When opening Lightbox content in the background no longer jitters. Improved: In Full Page Slider and Page With Background you can now select new modes of image cropping: "Fit Horizontally" will prevent sides from being cropped. "Fit Vertically" will prevent top and bottom parts from being cropped. "Fit" will prevent cropping. Fixed: Accent color setting will take effect in the secondary (top right) menu. Improved: Mouse wheel / Trackpad vertical scrolling is now much smoother. Improved: SEO improvements — site title is now H2 instead of H1. Adds ALT attribute on logo with contents set to site title. Improved: Large images in Flexible Grid Portfolio will not look pixelated. Fixed: Password protected posts will no longer return 404 when 'Hide Password Protected' posts option is selected in Theme Options. Fixed: Lists all projects when filtered by Project Type. Previously they were limited by 'Blog pages show at most' value in Reading settings. Fixed: Mouse wheel scrolling now works on horizontal portfolio page. Improved: Lazy loading project images will set their alt tag to image caption. Improved: Slows down Full Page Slider animation when initiated by touch swipe. Improved: Updated slider easing function, which results in a smoother animation when switching images. Fixed: Share widget, which stopped working after Twitter API changes. Twitter counter was removed because it is no longer possible to retrieve tweet count. Whole counter section is now hidden by default. It can be re-enabled in the Theme Options > Social. Fixed: Share widget was overlapping content in Horizontal Grid Portfolio layout when viewed on mobile devices. Fixed: StumbleUpon and LinkedIn share buttons won't appear in the footer if they have been previously shown in the "Share This Project" section. Fixed: Magic Mouse super-sensitive scrolling on Horizontal Portfolio / Horizontal Grid Portfolio. Fixed: Highlighting colors would appear when quickly changing images in Lightbox (or double clicking anywhere). Fixed: Various iPad issues due to recent iOS updates: main menu, portfolio. Fixed: Accent color won't have effect on active sub-menu items. To make this fix work go to Appearance > Customize and re-save your accent color. 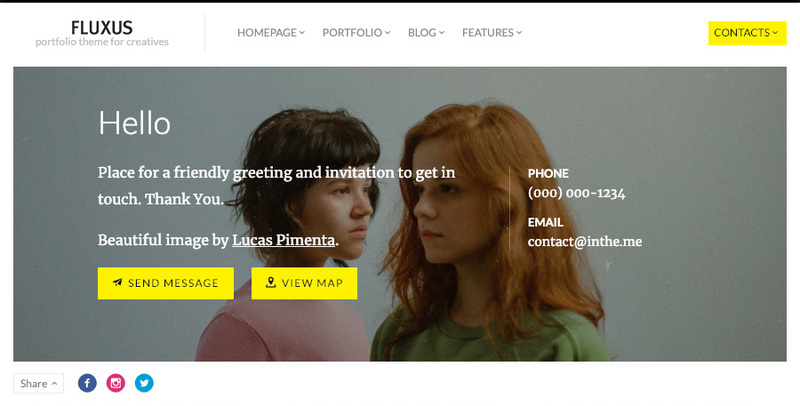 Improved: Contact page has better responsiveness, prevents content from getting cropped. 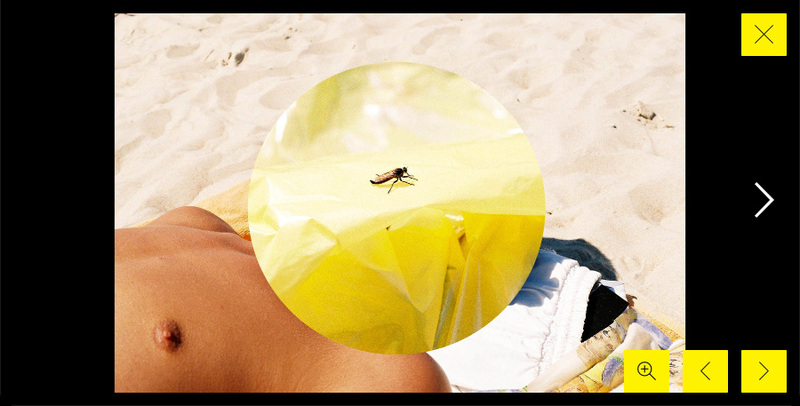 Improved: Uses 2 times larger images in Vertical Blog to prevent pixelation. Improved: Increased image size on Horizontal Blog to prevent pixelation when viewed on mobile devices. 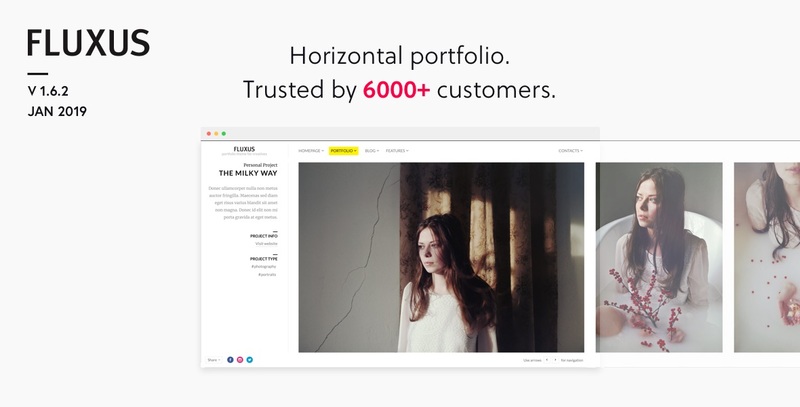 Improved: Horizontal Portfolio no longer has 'View Work' button. Instead all image is clickable. There is an option under Appearance > Theme Options to bring back the previous behavior. Improved: Other projects will use smaller images for thumbnails to improve performance. Fixed: When clicked on the image in Lightbox to go to next image it would go to previous image instead. Fixed: JS errors in admin area when trying to configure Page with Background. Fixed: Gallery shortcode will work with images that are smaller than 500x500. Added: Completely new mobile menu with support for child page navigation and custom background image. 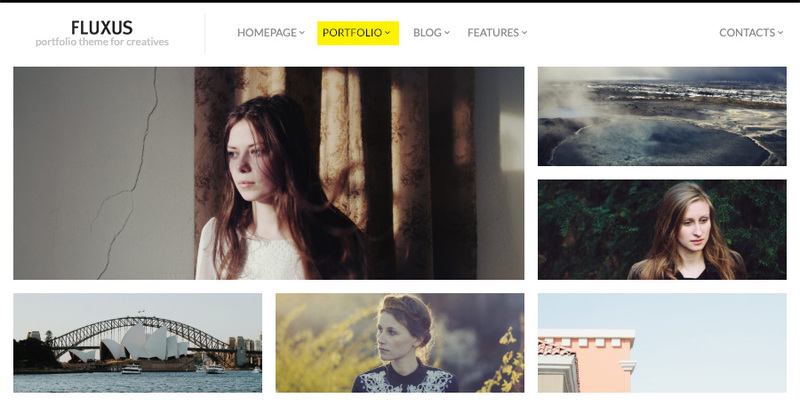 Added: Grid Portfolio supports cropping point selection for each individual image. Improved: Retina support in Grid Portfolio, Vertical and Horizontal blog. Improved: HTTPS support by loading external resources over HTTPS by default. Improved: Lightbox will show loading message only if it takes longer than 1 second. Improved: [gallery link="none"] shortcode will prevent Lightbox from appearing when clicked on an image. Fixed: Footer overlapping issue on Grid Portfolio page when viewed on mobile devices. Fixed: styling issues caused by WP Admin Bar (it is still disabled by default). Fixed: Project ordering issues on Project Type pages when using Wordpress 3+. Fixed: Footer would overlap images on grid portfolio in specific cases. Improved: Lightbox changes cursor into right and left arrows depending on the action that would happen if a user click on the image. Fixed: Permalinks issue that resulted in "Not Found" errors when accessing projects. Notable change: css/user.css file moved to user.css so that the file can be edited via Appearance > Editor. Added: Vertical grid layout with support for different image sizes and fixed aspect ratios. Improved: Every graphic asset is available in high resolution and look sharp on high-definition (Retina) devices. Improved: Images in Lightbox can be navigated by clicking anywhere on the right or left sides (to to to next and previous accordingly. Fixed: Contact form issues, when placed inside a scrollable container. Fixed: Videos in blog posts no longer lose aspect ratio when resizing. Fixed: Website title is no longer repeated twice when using SEO optimization plugins. Fixed: Vertical blog page no longer crops images that exceed 328px in height. Improved: Scroll bars on contacts page and page with background scrollable by dragging. Improved: Pinterest sharing now allows to pin multiple images from a page. Added: Ability to toggle comments for pages and posts using Screen Options > Discussion > Allow comments option. Added: Click to navigate option for project images. Clicking on project image will scroll to the next one. Added: Theme option to show Full Page Slider navigation on all times rather than on hover. Added: Ability to use grid or horizontal portfolio layout to display different project types. Added: Other projects section now can show projects that belong to a specific project type. Added: Theme options that allows to disable "Other Projects" and "Like this project?" sections. Added: Container scrollbars in Page with Background and Contacts page. Added: Site description option (note that if you use any kind of SEO plugin, you should disable Fluxus meta tags in Theme Options). Added: Grid Portfolio can be used for displaying projects filtered by Project Type. Fixed: iPad with iOS 7 no longer auto scrolls to the top on pages with vertical scroll bar. Fixed: Project media items in admin section now works with older (3.5+) Wordpress versions. Fixed: iOS7 Safari bug that used to allow vertical scrolling on horizontal pages. Fixed: Page not found error on password protected projects when "Hide password protected projects" option is active. Fixed: "Like This Project?" section not working on screens with small height. Fixed: Project media order issues. Order is now saved after clicking "Update". Fixed: iPad sizing issues when changing orientation, featured images on horizontal portfolio are now clickable. Fixed: Pinterest is now able to find images to pin on Full Page Slider. Fixed: Google Plus overlapping text "Recommend this on Google" removed. Fixed: Issues uploading image files on Wordpress Admin, when image sizes cannot be determinated. Fixed: Unnecessary padding removed from sidebar making it a bit wider. Added: Project images will use attachment title as an alt text. If description is present, then it will be used instead. Fixed: Mouse wheel in project sidebar does no longer scroll main window. Fixed: Videos in projects will upscale until to a maximum width which fits in browser window. Fixed: Vertical blog displaying issues on Safari (iOS version was affected as well). Fixed: Images no longer upscale when screen size is bigger than the image. Fixed: Header overlapping issues caused when some servers were not able to determinate logo image size. 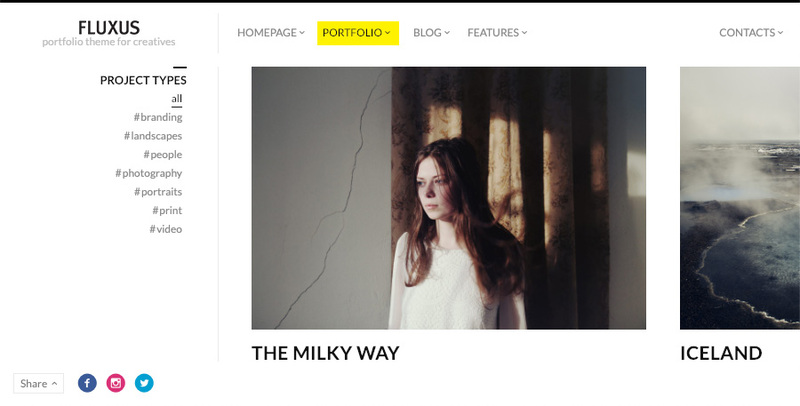 Fixed: Grid portfolio navigation with arrows makes sure no image is cut by the end of the screen. Fixed: Issue that prevented from sorting / deleting project media on specific server configurations. Fixed: Arrow navigation now puts images and videos in the center of the screen. Fixed: Images in portfolio become disorted when screen is bigger than the image itself. Fixed: Share functionality now gets disabled if there are now sharing networks chosen. Fixed: Send Message button works even if Google Maps API key was not added. Changed: Image upscale option now takes an effect for videos as well. If disabled, then project videos will not exceed their dimensions provided in the embed code. Changed: Project Types are no longer hard coded in the sidebar. They are available as a widget and can be easily added or omitted. Changed: Lightbox no longer slides in from the top, but rather fades in and looks cooler. Changed: Date format in blog is shown according to the one specified in Wordpress settings. Use "M j" setting for the best look.